This CellML model has been checked in both OpenCell and COR. However the model contains partial differential equations which are currently beyond the scope of the CellML API. ABSTRACT: The purpose of this study is to investigate theoretically which intracellular factors may be important for regulation of mitochondrial respiration in working heart cells in vivo. We have developed a model that describes quantitatively the published experimental data on dependence of the rate of oxygen consumption and metabolic state of working isolated perfused rat heart on workload over its physiological range (Williamson JR, Ford G, Illingworth J, Safer B. Circ Res 38, Suppl I, I39-I51, 1976). Analysis of this model shows that for phosphocreatine, creatine, and ATP the equilibrium assumption is an acceptable approximation with respect to their diffusion in the intracellular bulk water phase. However, the ADP concentration changes in the contraction cycle in a nonequilibrium workload-dependent manner, showing the existence of the intracellular concentration gradients. The model shows that workload-dependent alteration of ADP concentration in the compartmentalized creatine kinase system may be taken, together with the changes in P(i) concentration, to be among the major components of the metabolic feedback signal for regulation of respiration in muscle cells. Schematic diagram of the two-dimensional compartmentalised energy transfer model of cardiac cells: the components of the model. 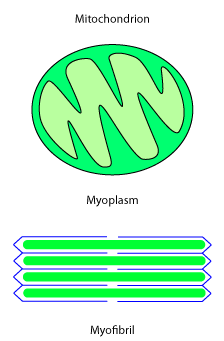 The total diffusion pathway is 1.2 micrometres, including the outer mitochondrial membrane, the layer of myoplasm and the myofibril. Creatine kinase (CK) and myosin magnesium ATPase activities are distributed non-uniformly along the myofibril. Derived from workspace Vendelin, Kongas, Saks, 2000 at changeset 54152205044e.